Background: This distance client is no new comer to holistic medicine or the health care industry in general. This client is a self-made man in industry utilizing nutritional products. This client had been treated, unsuccessfully for H. pylori and other GI issues. We had our consultation and based on his laboratory tests I came-up with a specific protocol and recommended some lifestyle modifications. As you can see the protocol was successful. There were no pharmaceutical used in this protocol. I began my research on the web to cure h. pylori naturally. I followed two website’s protocol for 3 months. I was very disciplined on their protocol but kept testing positive. I then read Dr. Marcus Ettinger’s site and called him. He was extremely professional and very helpful and sensitive to my concerns. He recommended a natural protocol and I followed it for 34 days. 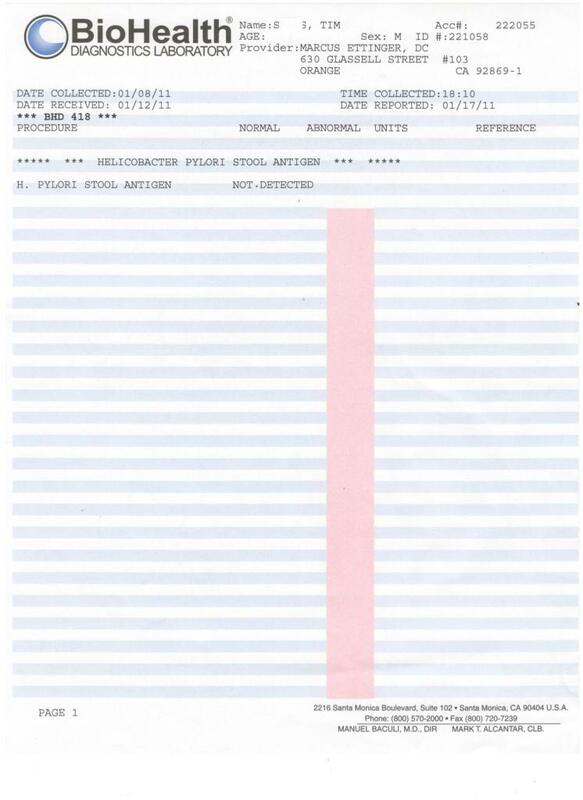 BioHealth Diagnostic’s test #418 (Helicobacter pylori Antigen) came back negative.